A section on the Match Lake was won by Paul Cook (Frenzee) with a massive 114-160kilo (253lbs) from peg 4. Paul fished short and down his edges with 6mm banded pellet. 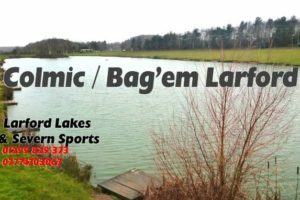 Lake winner was Ray Lamb from peg 63 with 159-300 kilos (353.8lbs) which is a new lake record. Ray caught short and down his edges with banded 6mm pellet. Grant caught on the method short and down his edges on the pole. Lake winner today was Chris Bradney (H.T. Angling) with a superb 95-000 kilos (211lbs) from peg 67. Brad caught short on the method feeder and down his edges on the pole. Section D winner by default was Neil Cotton with 88-200 kilos (196lbs) from peg 74. Neil caught on Method short and down his edges. Lake winner was Matt Marshall (Colmic) from peg 11. Section winner by default was Graham Dack with 43-080 Kilos (96lbs). Graham caught shallow and down his edges. Overall weight (51 anglers) for second day 2939.620 Kilos. Average per Man 131lbs per man per day.